227 Magic Items Entered thus far in the OSR Superstar Competition - Yarr! Where be me Maps and Treasure? Entries for the OSR Superstar Competition are poring in today - 25 new items enters since this morning's post with just over a day left to enter. I still need to sit down and figure out where all of the new prizes fit, which is certainly a good thing. We are probably going to increase the number of qualifying entries from 8 in the first round to 12 or 16 just because of the sheer number of entries. The first 8 would get the prizes already mentioned and the additional qualifiers would get $5 RPGNow gift certificates as well as moving on to the 2nd round. The response really has been amazing. I'd like to offer up 4 prize bundles for the finalists. 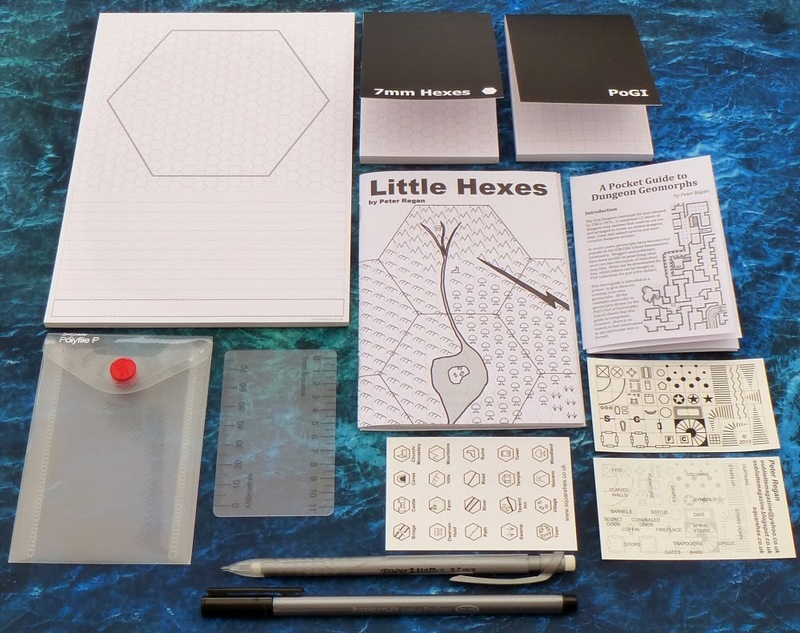 They contain some of printed pads from my site Squarehex.co.uk along with a few accessories. Apparently I need to get back into mapping again, because a package like the above just makes one want to map. 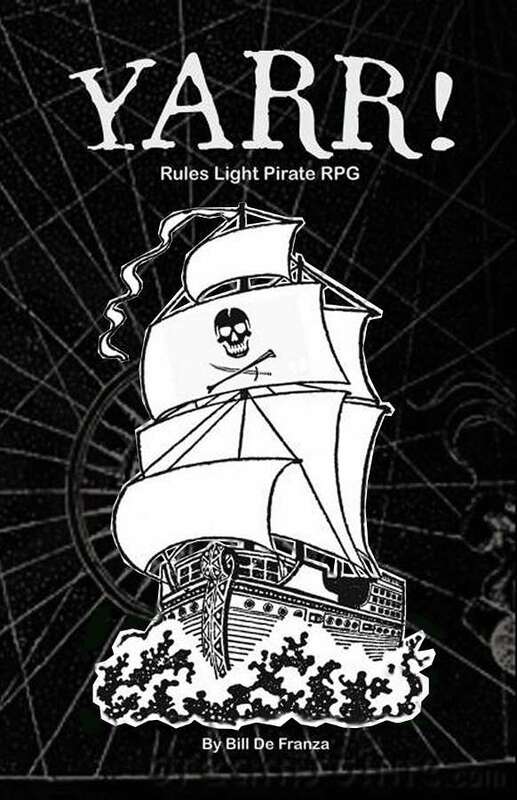 +Bill De Franza is adding 3 PDF bundles of YARR!, an OSR styled rules light pirate RPG. If you want to roleplay pirates with kids, adults or a fine mix of the two, this is a fine choice. 227 Magic Items. Over 100 folks sending submissions. Unlimited fun. It's what being an OSR Superstar is all about. There's a day left to enter. Have you submitted YOUR entries yet? 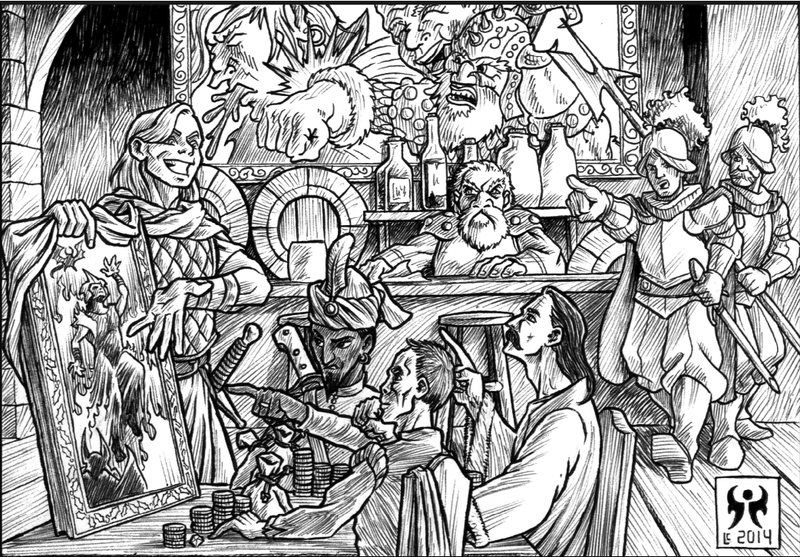 Tavern Art from the Soon to be Released "Guidebook to the City of Dolmvay"
Tenkar's Tavern. The brazen thief Janni the Lucky takes bids on a (stolen) portrait of what appears to be the young wizard Kormydigar surrounded by angry demons. The curio shopowners/ pawnbrokers Abah the Dealer, Bekker of Malthaven, and Cadfan the Moneylender make offers while the grumpy dwarf Tenkar the Barkeep looks on disapprovingly. The Valenon guardsmen stop by for a chat. I told you we had more prizes being donated and we do. This morning I'd like to highlight the gifts of two of the OSR's publishers. 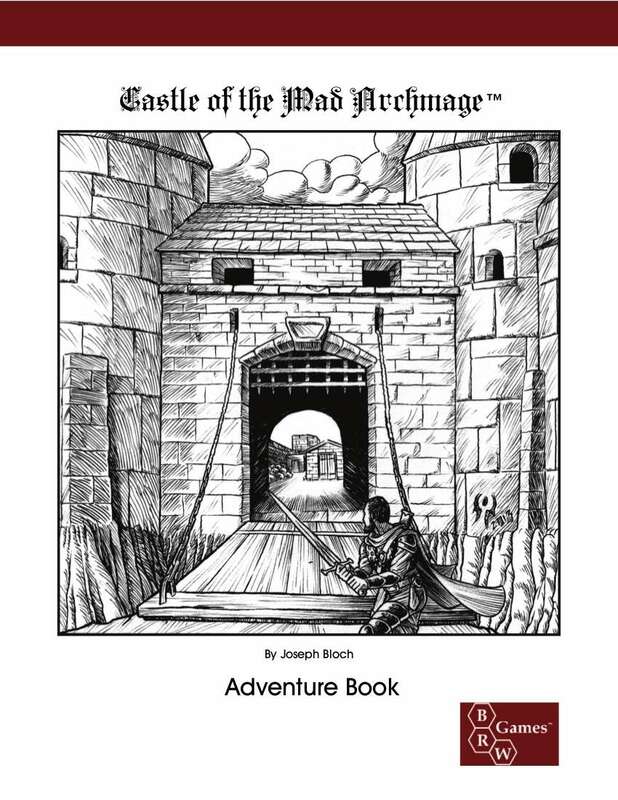 +Joseph Bloch is donating a print hard cover copy of Castle of the Mad Archmage. It's a sweet megadungeon that Joe has published under his BRW Games imprint. I'll be reviewing this in the near future, as I find some down time after the first round of the competition closes to entries and it all gets tossed into the hands of the judges. 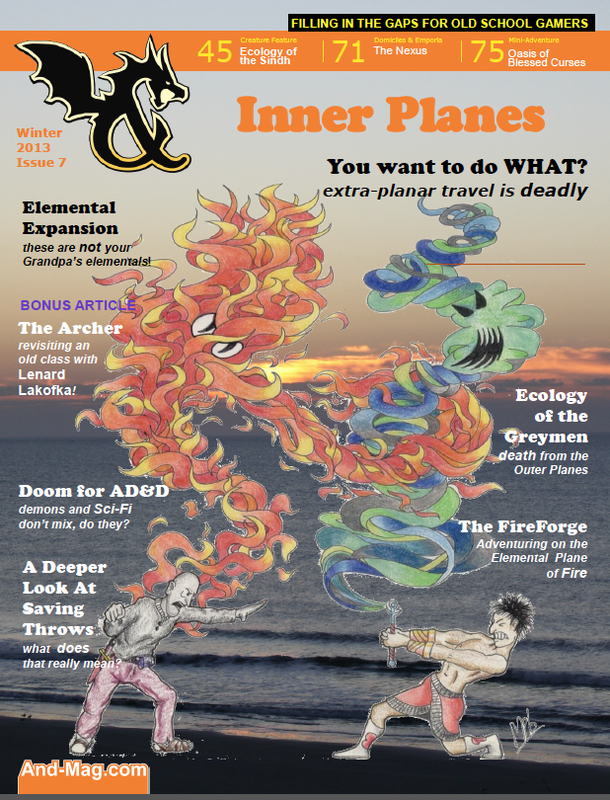 Ecology articles, new classes, adventures, interviews, game theory - it's all there and more. Did I mention the hyperlinked contents page? Sure, it's new fangled and I'm turning into the old guy that yells at the kids to "get off my lawn" but I think it's awesome. Issue #7 even has an interview with +Vincent Florio , which besides being interesting on it's own even includes a shout out to me. How the hell did I miss that before? I have every issue of "&" Magazine on my hard drive, but I've never spent the proper amount of time doing more than a quick flip though and occasional article read. It appears I need to look closer. Yep, 177 magic items have been submitted to the OSR Superstar Competition. Somewhere around 90 folks have entered. I am going to extend the contest until 1159 PM on Sunday Night, February 16, 2014 NYC time. We are adding about a dozen hours, no more. If you are going to enter, don't wait much longer. Now, with that out of the way, I'm going to announce some more prizes for the prize pool (and we have even more prizes to announce, so yes, this is going a bit insane and that's the way we like it). Winner gets 50% off on one order up to $1000 total order amount. 4 runner up coupons for 25% off, up to $1000 total order amount. Everyone who enters contest with what judges consider to be an actual entry gets a coupon for 10% off one order up to $1000 total order. Now that's pretty f'n cool! Finishers in the 2nd to 4th finalist spots will get coupons for 25% off, up to $1000 total order amount. 155 Magic Items Submitted Thus Far for the OSR Superstar Competition - Are they Buried in the Barrowmaze? I just tallied up the entries that we've received to date for the OSR Superstar Competition and we are now at 155 Magic Items submitted for the first round of the OSR Superstar Competition. Submissions are open through Sunday. I am totally blown away by the response, not just by those entering but by those supporting the contest with additional prizes beyond what was initially announced. If you somehow missed the announcement, Barrowmaze Complete is currently seeking supporters over at Indiegogo. It includes BM I + II along with new material, professional layout, an optional support level that includes minis and more. I'd rather be home reading RPG books - but as we are having work done on the house, that probably wouldn't have happened if I'd been able to stay home anyway. So, what are you doing on this icy, snowy, wet, windy Thursday in February? Dare I mention there are more cool prizes being donated? If we hit 200 entries, there is an extra $50 into the prize pool? That this, like other events I've been involved in, have taken a mind of their own? Just Ran a 5 minute long, Imprompt RPG Session with my 3 Year Old Niece - Using the Cover of "Dagger For Kids"
My niece is 3 years old, and loves gaming dice (I had to buy her her own set of squishy polyhedrals). She's also been on a "monster kick", where imaginary monsters scare the crap out of her. Tonight, she wanted to see my "website". Who am I to say no. We looked at various recent posts, and when I scrolled to Dagger for Kids" she got excited. She wanted to know "what is that?" and "why is he holding a sword?" (her father is a lapsed gamer). I told her it was three heroes, and they were beating up monsters. She wanted to know what everyone was holding - axe, shield, armor, wizard robes - she really liked the robes. I asked her to name the three heroes. Hank is wielding the sword, Shannon (my niece's name) is the wizard and Rachel (my wife's name) is wielding the axe. No idea where "Hank" came from, unless there is one in her pre-school class. Anyhow, she asked me to tell her what was happening in the picture. I told her the "almost scary monsters" wanted to grab the heroes and asked he what the heroes were going to do. She said "Shannon throws ropes on them!" (just like the picture, but it is probably webs ;) and Hand and Rachel were going to "crack them on their heads and tell them to GO HOME!" All that was missing was killing things and taking their stuff. She watches a lot of Spongebob, so maybe that's where the "crack them on their heads" line came from, but I'm damn sure I have a future gamer in the family. 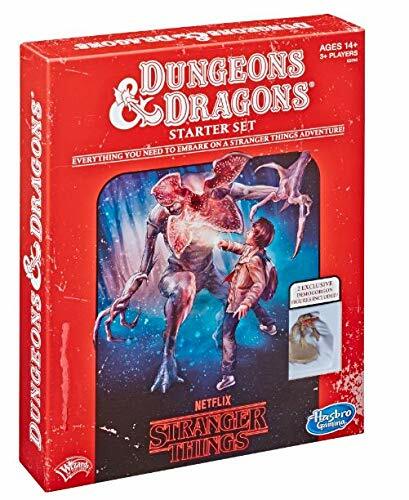 Guest Post - "How Play-by-Post Made Me a Better Gamer"
I was just a kid back in the early days of role playing games - you know, the late 70s and early 80s. My cousin introduced my brother to basic edition of Dungeons & Dragons, who then roped me and all his friends into gaming. Sure we didn't understand a lot but we had loads of fun and I still look back on those days with fondness! As the years rolled by and the devil-worship mentality took over in our town I left the gaming scene for a long time. 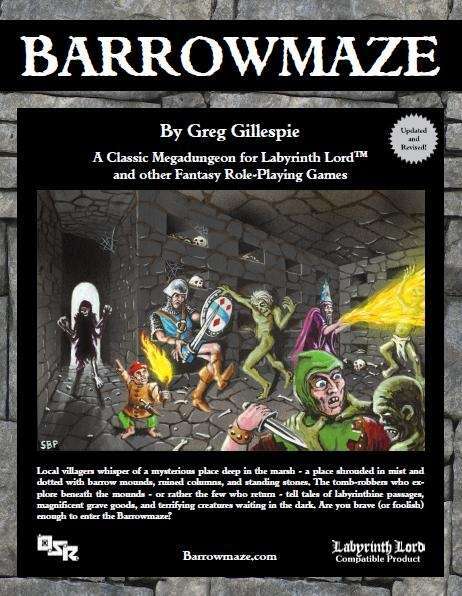 In 2008, however, a neighbor got me back into the hobby, and it didn't take long before I discovered the OSR and the fantastic retro-clone systems like Swords & Wizardry, OSRIC and Labyrinth Lord. A while later I started an online game (via Skype) with my brother and his family, but it just wasn't the same as it had been those many years before. Yeah, we still play, once in a while, but arranging a time for everyone to get together is proving more and more difficult and less and less likely. I have enjoyed keeping up on the hobby, however, by reading blogs, web sites and many of the cool books and supplements put out by members of the community. A few months ago I had the bright idea to look for an online RPG group that didn't require a huge chunk of my precious free time. I struck upon the lucky idea of play-by-post, or PbP as it is also known. 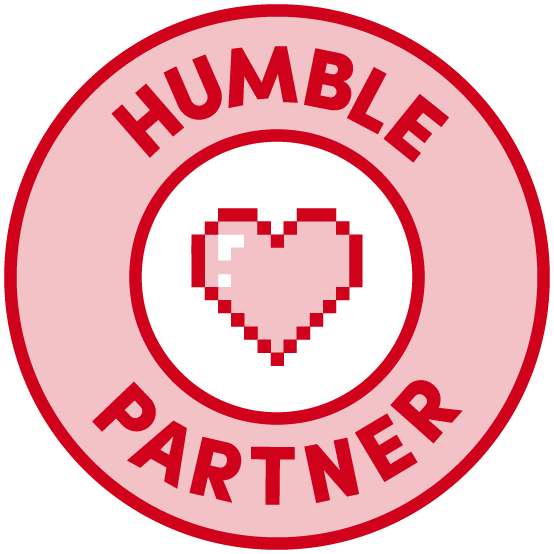 I spent several days searching for a good community and site, and finally settled upon joining Roleplay Online - mostly because they had a number of specialized tools and tailored software that made the PbP experience easier and more fun. Also, they had a robust community of several thousand active members, which made it easy to get into a game quickly. Since taking the PbP plunge I have made several surprising discoveries. First, let me share with you the unexpectedly good things. I've become a better role player. Yeah, I've found that spending some time thinking about and composing a well crafted reply has made me take more notice of my character and try to do as he would do and say as he would say. I'm getting a much broader gaming experience. Whereas nearly all of my pre-PbP gaming experience was concentrated in the fantasy genre, I find myself now branching out into lots of games, such as Call of Cthulhu, classic Spycraft and many of the awesome science fiction games I've always thought would be fun to try but never had the time to do so. I can play on a time schedule that suits me. Time was my biggest issue for getting into PbP - both the amount of time required for a regular in-person gaming session and when I was able to set aside that much time to play. PbP has let me play games on my own schedule. I can post whenever I want, and spending as little as a few minutes each day keeps me connected to my game and the gaming hobby in general. However, there have been some adjustments which weren't so fun to make. Here are some of the cons I've found with PbP. The play action is much, much slower. Yeah, be prepared for things to move glacially slow. My rule of thumb is that it takes about one month to cover as much as we would in one hour of real face-to-face gaming time. That can be agonizing, but it also allows me to play in more simultaneous games than I otherwise would have the chance to do. Some of the rules and actions need to be tweaked in order to be feasible on PbP. I'm finding that games with more rules (such as d20 based games and several newer RPGs) tend to be more difficult to play. I think this is a natural result of needing to know more details for those types of games - such as the exact relation between two combatants, or where characters are standing when surprised by some dastardly villain. However, the upside to this is that old school rule sets are very well suited to PbP! Give PbP a try if you don't have a regular group... or the time to play in one. PbP may be right for you if you want to experience some game systems you otherwise might not get a chance to play. And finally, this type of gaming may be your cup of tea if you want to get in a little bit of quality gaming time each day. Most of all I've found that, just like other things in life, you get out of it what you put into it - so go for broke and have a blast doing it! If you've had experience playing RPGs by post then please let us know how it turned out. Rusty loves the OSR and tries to constantly keep up with its ever growing flood of blog posts and awesome products. Although he doesn't have a gaming blog you can contact him at his science fiction review site: BestScienceFictionStories.com. Talking About Magic Items - How Do You Handle Charged Magic Items? Do you tell the player the number of charges when they find the magic item? How do you determine the number of charges? Can a totally spent charged item be recharged? How do you handle recharging charged magic items? 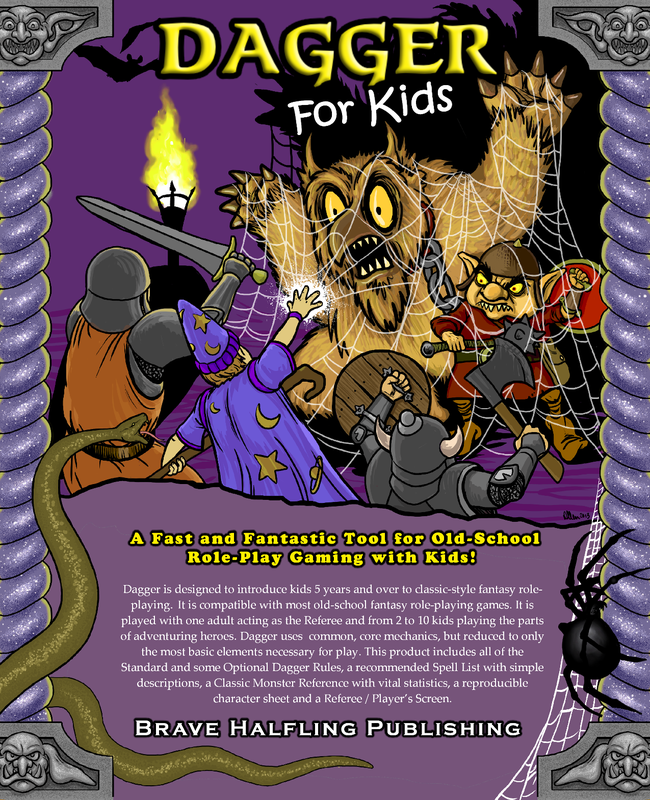 A Gift for All that Enter the OSR Superstar Contest - "Dagger For Kids"
Everyone that submits an entry to the OSR Superstar Competition will get a PDF copy of the soon to be released revised Dagger for Kids, courtesy of +John Adams and Brave Halfling Publishing. We have over 70 magic items submitted thus far - not bad for just over 48 hours. We also have additional prizes to announce, ranging from discounts, miniatures, in print RPG products, PDF products and more cash for the prize pool - exciting times will only get more exciting. I'll try to announce the additional prizes daily. What are you waiting for? 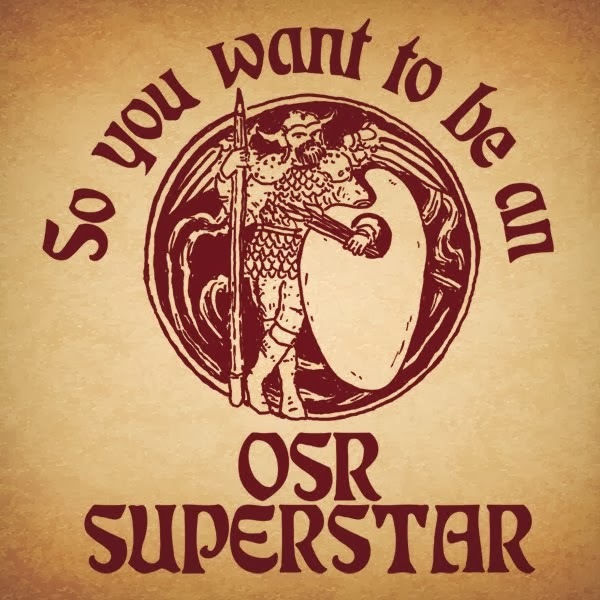 Read the rules for the OSR Superstar Competition and enter today! I game with bloggers, game designers, artists and the like. I'm probably the least creative in my gaming circles. I love reading the feedback and experiences of those that game with me. Seriously, read it. He makes some great points. 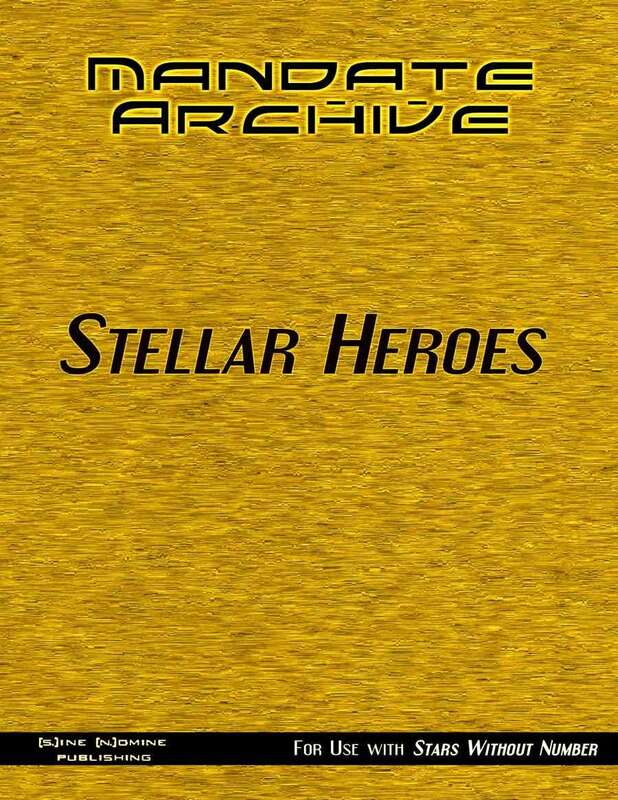 Mandate Archive: Stellar Heroes (free) does for Stars Without Number (free) what Black Streams: Solo Heroes (free) did for fantasy OSR clones - it gives us a short, free supplement that enhances one on one gaming with a GM and a single player. Did I mention it was free? If you enjoy Stellar Heroes, consider grabbing Black Streams: Solo Heroes for a version of these rules intended for compatibility with Labyrinth Lord (tm) and other similar old-school games. Keep on the lookout as well for Scarlet Heroes, my old-school-compatible game of fearless adventure for one hero and one GM! OSR Superstar Competition - 35 entries in 32 Hours! We are having an excellent response to the OSR Superstar Competition - 35 entries in 32 hours! Simply amazing! 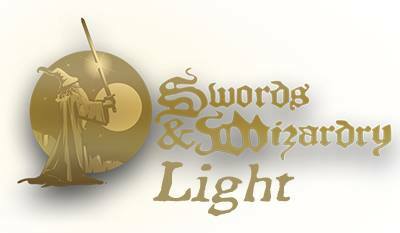 I'm going to throw out an additional carrot if we hit 135 entries of Magic Items for Swords & Wizardry - not only will the top 8 entries win $10 in RPGNow Gift certificates, but the top 16 vote getters will also get PDF copies of the D30 DM's Companion, courtesy of readers like you. I was listening to an episode of the Roll For Initiative podcast on the drive to work this morning and the topic of awarding XP came up. Give XP for gold or not? Full value or modified? Give XP for magic items found? Give XP for overcoming obstacles? Give XP for attaining goals? Give XP for overcoming monsters? I award for overcoming adversaries, recovering gold, ad hoc XP for attaining goals and overcoming obstacles. Session write ups award a 10% expo bonus. I also award a small bump in XP awards to my once a month group compares to my more regularly meeting group. Not a huge bump, but it it there. How do you award XP in you campaigns? 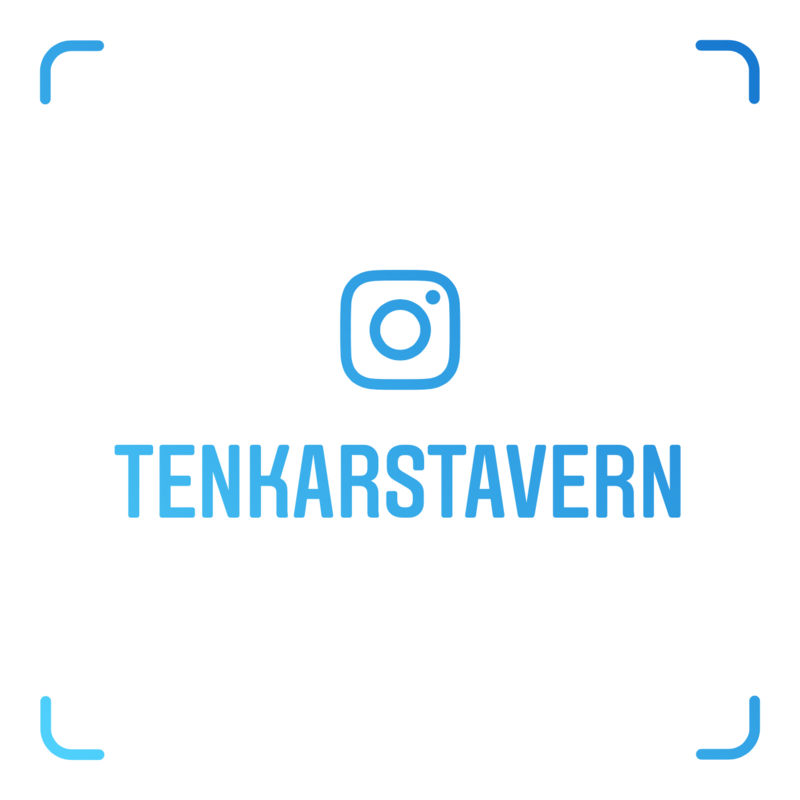 If You Could Make One Post Here, at The Tavern, What Would it Be? I've had two guest posters recently, one the other week and one tonight. I finding that I'm enjoying hosting the postings of others. Different perspectives are fun for me, even if I don't always agree with them completely (not saying that about my guest posters, just making a general observation). I've been told I have "reach" and "influence" between the traffic The Tavern sees and those that have circled me on G+. That very well may be. If so, I'm offering it to the community that has given it to me so freely. I'd like to have a guest poster or two a week. We'll see if I get enough inquiries. If you are interested, use the contact form on the right and send me a query letter. Well, nothing that professional, but give me an idea of what you want to post about. I do reserve the obvious right to not publish a submission, but I doubt many potential posts will get denied with the creativity my readers have. Dylan Hartwell, AKA the Digital Orc, has been playing and running roleplaying games since 1985. He has played in and ran D&D, RIFTS, and Dark Heresy campaigns each running more than fifty individual game sessions. Dylan has attended more than 20 gaming conventions since 1997 including Con on the Cob, Origins, and Gencon where he has run multiple Labyrinth Lord adventures. 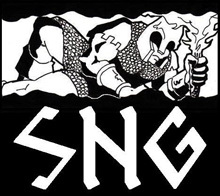 He has maintained an OSR blog called Digital Orc at www.digitalorc.blogspot.com since 2010 and is an active member on the Dragonsfoot and Goblinoid Games forums in addition to being a regular commenter in the OSR blogosphere. He has self-published six Labyrinth Lord game adventures and supplements. Dylan holds a Bachelor’s degree in Education and a Master’s degree in Technology in Education. Gary Gygax helped get Gencon started way back in 1968. It’s always been a part of our roleplaying game culture. Even if players didn’t attend in person, the details in Dragon Magazine, the new products released, and later the awards all contributed to cohesion in our favorite hobby. It became a rallying point around which we players could both meet and measure our style of gaming. Recent reports of increased housing blocks in Indianapolis selling out faster than last year suggest that we’re on track to beat the record-setting 49,000 unique visitors that attended Gencon 2013. Midwest Gencon attendance also correlates with the rise of the OSR. That is, Gencon attendance was relatively stagnant through the second half of the 1990s and the following ten years, but experienced a massive surge during the second decade of the 2000s, as did our OSR movement concomitantly. This came up in conversation tonight. It's as accurate as any other definition (or not) that I've seen for the OSR.